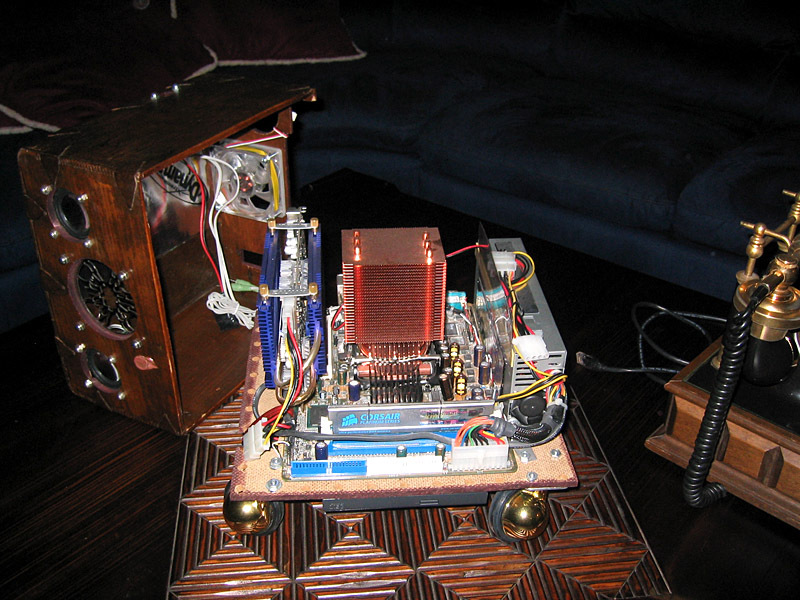 Intel contacted me during the Winter of 2004 to see if I could do a last-minute mod for an event they were sponsoring in Dallas. I had done many mods for them in the past and had a good track record of getting things done even on a short deadline. Skype was just becoming popular back then, along with MSN's voice chat. My then-girlfriend (current wife, congratulate me!) 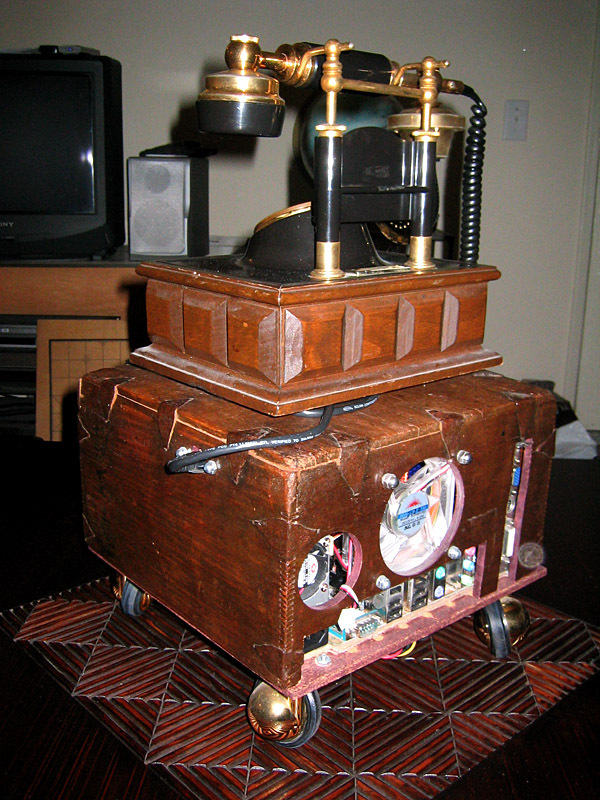 and I were on this antique shopping craze and I thought it would be fun to build a throw-back mod with present-day functionality. This is how the idea DialupPC was conceived. A Skype, MSN voice chat-ready (and now Google talk) PC with a retro twist. 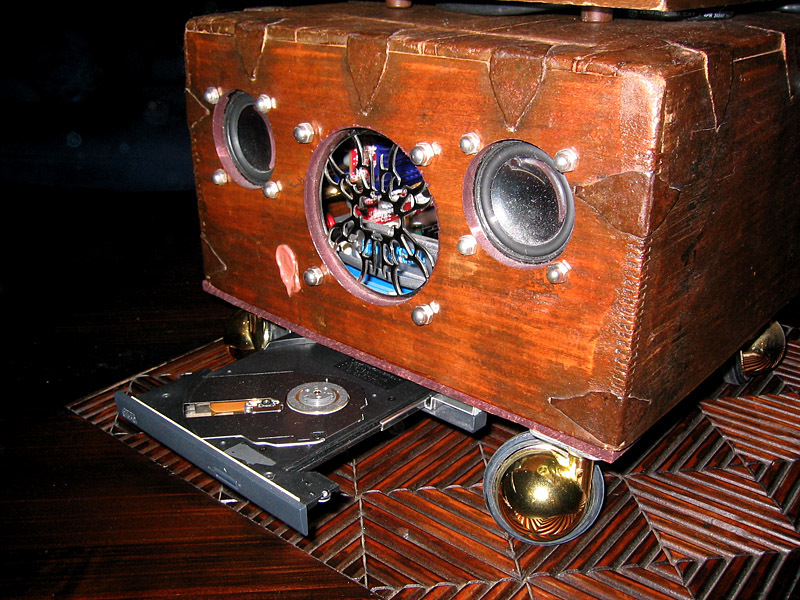 Audio normally plays through front of computer via the two built-in, magnetically shielded speakers.  When a Skype call, MSN voice chat or Google talk invitation is received, pick up the phone. Audio is transferred to the handset and mic is activated. Speak normally as if you were using a telephone. 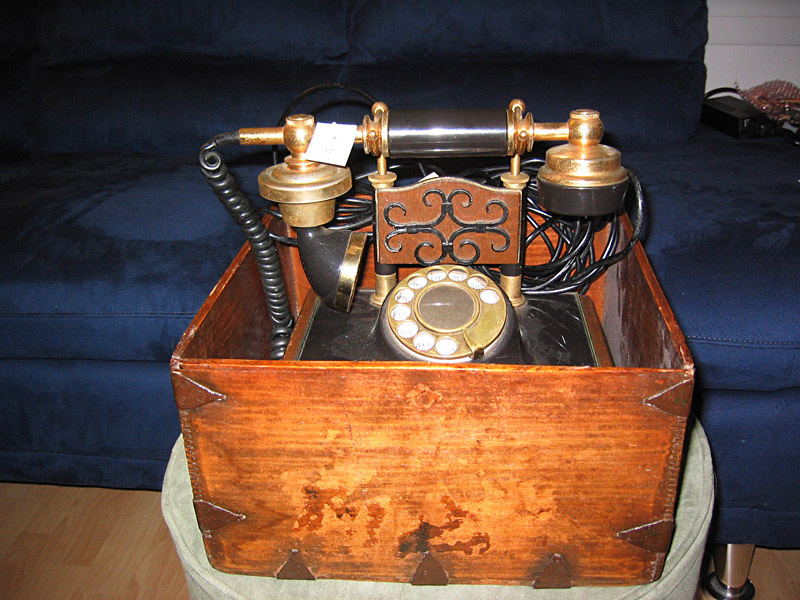 This is not a USB Internet phone. You are not limited to Internet phone service. 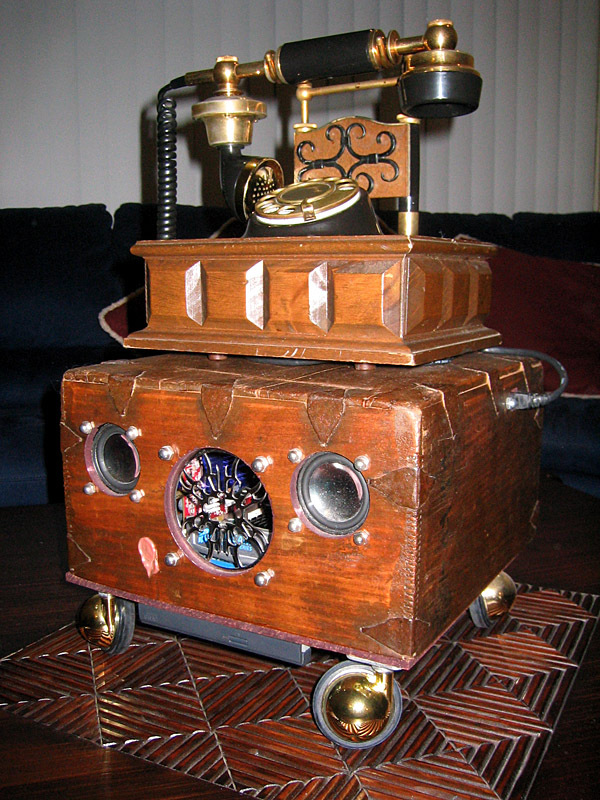 Computer audio is mechanically switched between speakers and handset via the hook. 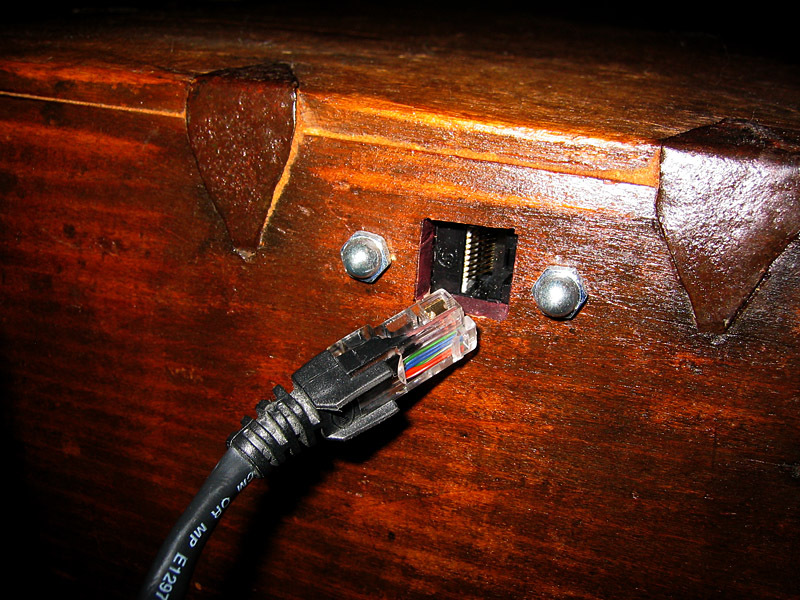 Original phone cable was modified from an RJ-11 cable to RJ-45 for a custom wiring setup. There are only 2 fans in this system. 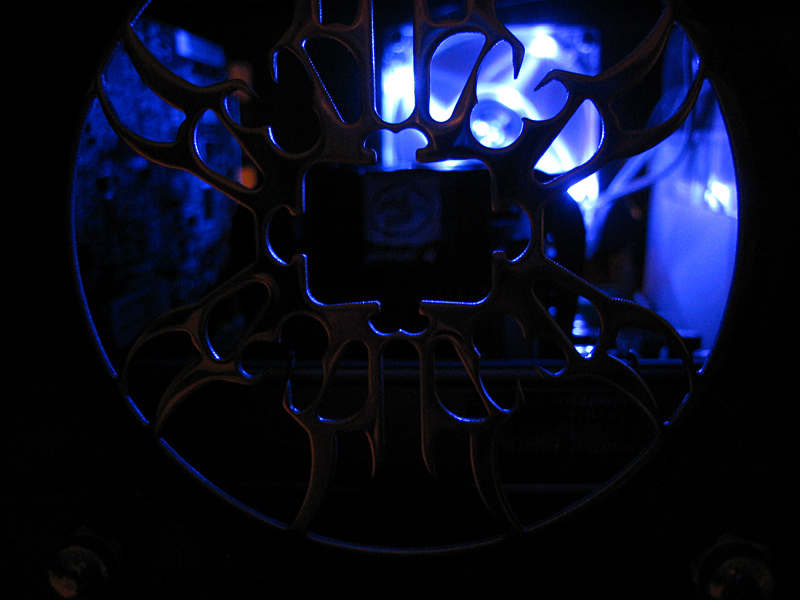 An 80mm fan for main system cooling, and the PSU fan. 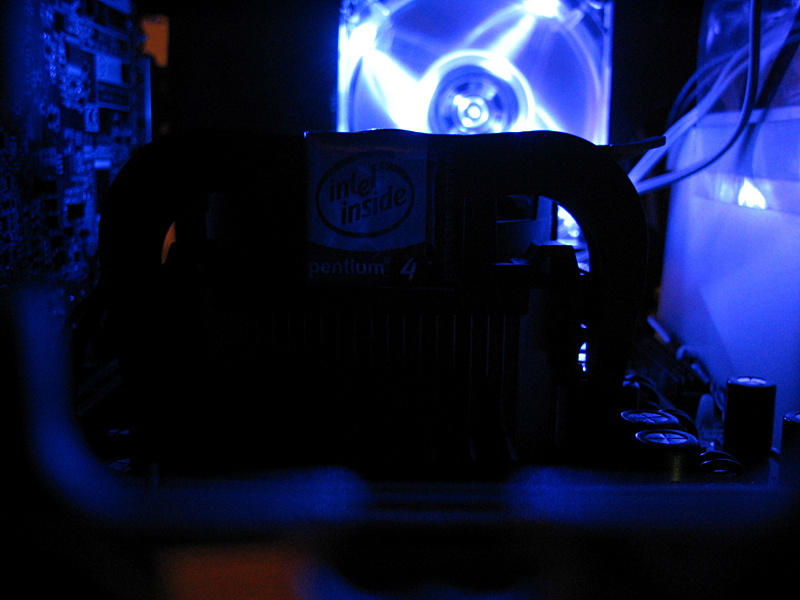 Airflow is directed in a "tunnel" flow directly from the front of the computer over the fanless CPU heatsink and out through the back where the single 80mm fan is located. No, that’s not gum on the front of the case! :) The box used for this case is an antique box that was originally used to import grain from another country (probably Asian). 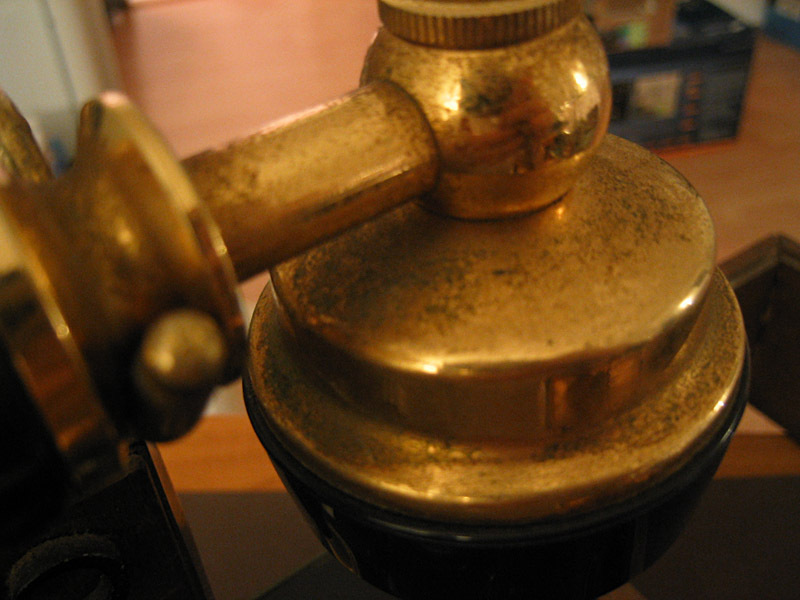 The wax seal you see on the front is the original inspection seal. (I thought it was gum when I saw it at the antique shop haha). This box was used some time around the 1930’s or 1940’s. 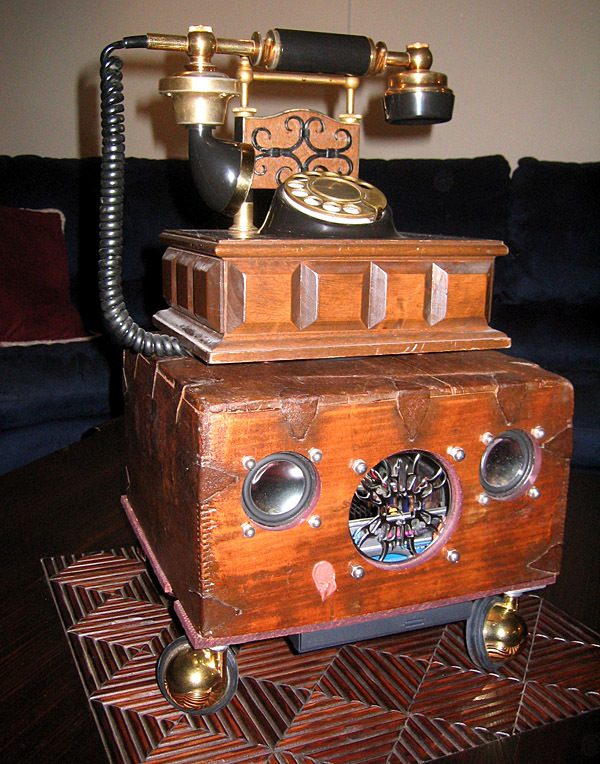 The telephone was made some time around the 1960’s to 1970’s. 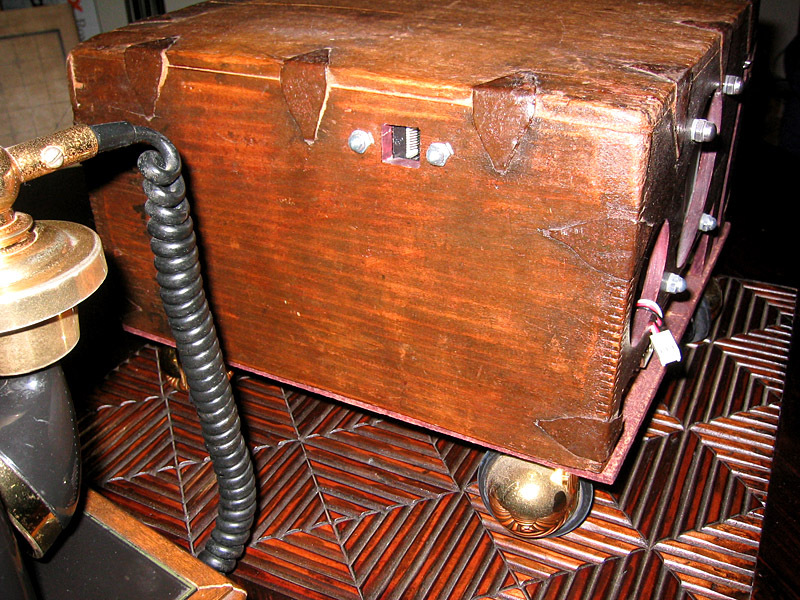 The original mechanical switches in the phone were used as part of the custom wiring work to automatically switch between handset and computer speakers. The phone line was upgraded to 8-wire cat5 cable to get enough wires in one cable for the wiring job. Currently in this system: 3.4Ghz Intel Pentium 4 Extreme Edition CPU, ATI Radeon 9800 (I think) 256MB, 512MB Corsair, 80GB Seagate Serial ATA, Laptop DVD-Rom. DialupPC opened up. The fan-less heatsink is placed to work with the single 80mm fan seen inside the top cover. Close-up from the rear of DialupPC. The plastic sheet attached to the PSU helps keep direct airflow from the front opening of the cover to the rear. Inside of the PC cover. 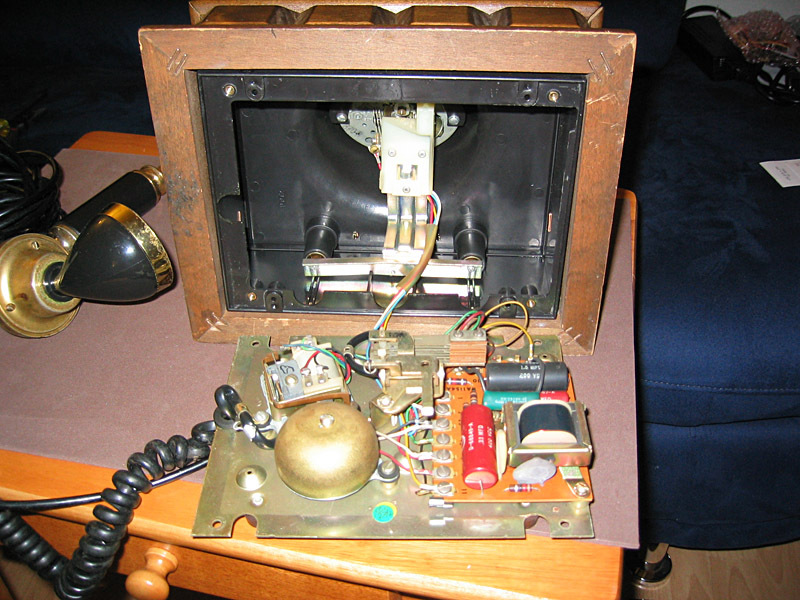 Magnetically-shielded speakers, the amp unit, and the wiring used for the phone jack. 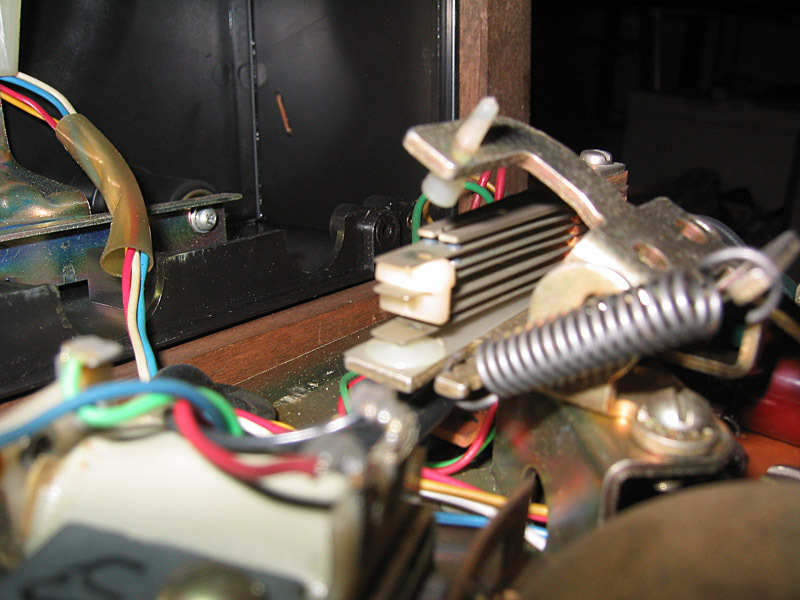 Dynamat was used to keep the case vibrations low. 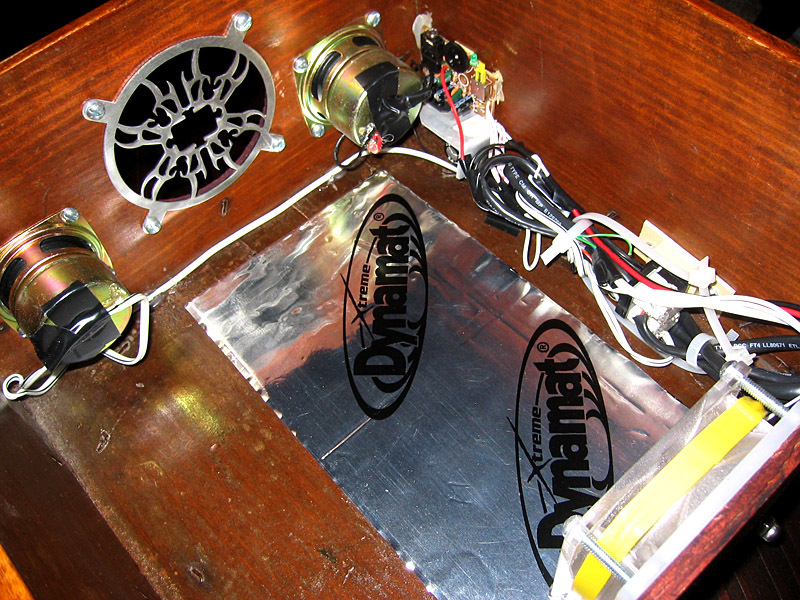 The aluminum foil material on the Dynamat also helps dissipate any rising heat from the system. 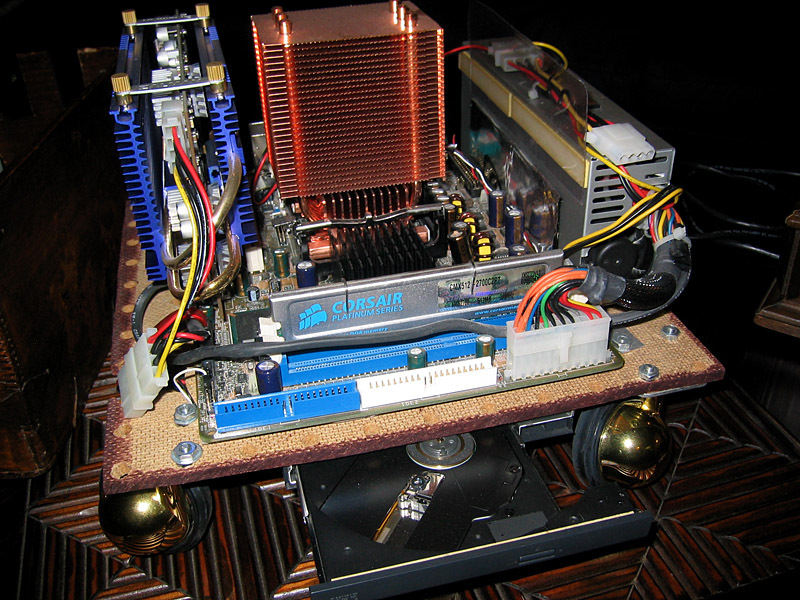 Front view of DialupPC with optical drive ejected. DialupPC straight from the antique shop! 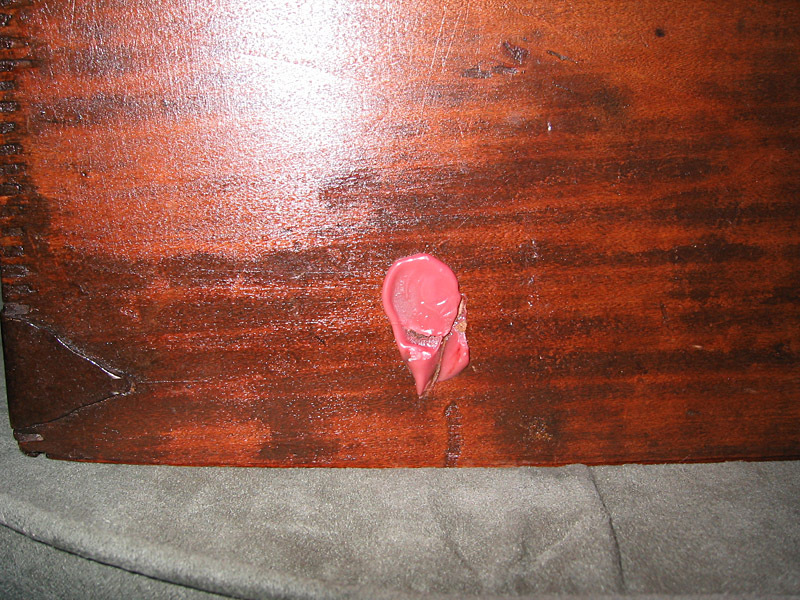 No holes drilled, no warranties voided (there wasn't one anyway). 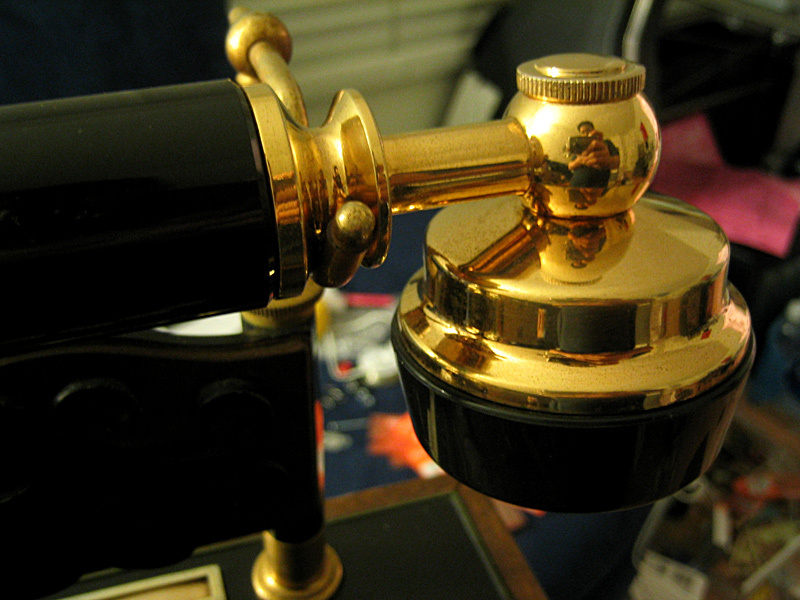 Close-up of the original inspection seal. I first thought this was gum on the side of the case and tried to scratch it off. I stopped as soon as I realized I was about to destroy part of this box's history. Close-up view from the front grill of DialupPC. The grill and rear fan were designed with a straight-through airflow design in mind. This pic and the previous pic show DialupPC with the original stock HSF. 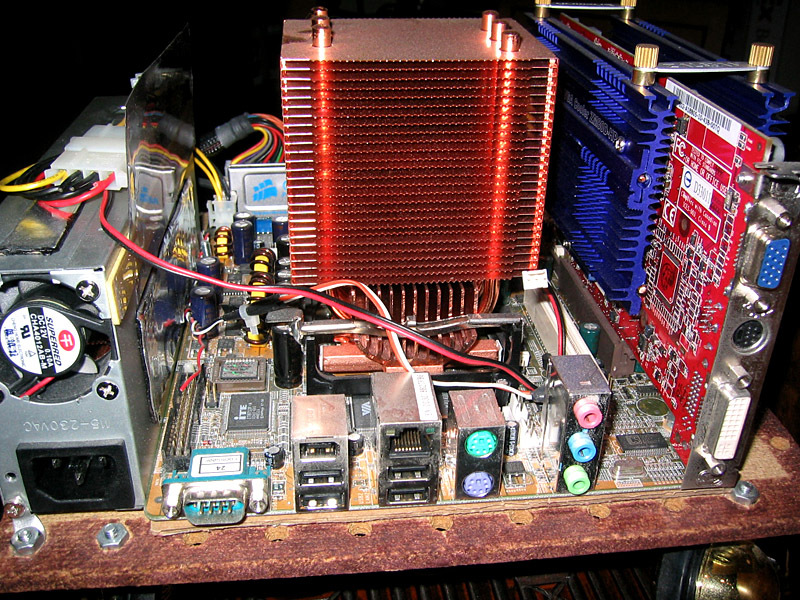 The fan-less heatsink was used in the completed build as seen in the first DialupPC pic.